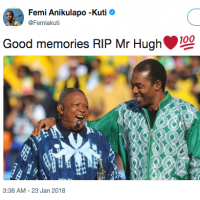 “Africa is fathomless,” said Hugh Masekela last Sunday evening when addressing a farewell reception, held in his honour at the Hyatt Regency in Port-of-Spain. The world-acclaimed South African musician, who spent the past month in T&T, was hosted by the Ministry of Arts & Multiculturalism and the South Africa High Commission. Among the specially invited guests present were Minister of Arts & Multiculturalism Dr Lincoln Douglas, South Africa High Commissioner Maureen Modiselle, South Africa National Association president Dr Earl Brewster, Head of the Public Service Reynold Cooper, Arts & Multiculturalism PS Dedra Bascombe, Deputy PS Vel Lewis, Culture Officer 1 Marlon De Bique, Janelle “Penny” Commissiong Chow, and her husband Aldwyn Chow, Leroy Clarke, Oloye Orawale Oranie, Ako Mutota, Dawad Phillip, David Brizan, Clive Zanda, NCBA president David Lopez, Tuco chairman Lutalo “Bro Resistance” Masimba, Pan Trinbago vice-president Bryon Serrette, 2013 Young Kings Monarch Stephen Marcelle and artistes Ataklan, Black Sage and Lady Adana. Masekela, who departed the country last Monday, was in the country to do a collaborative CD with Petrotrin Siparia Deltones Steel Orchestra, led by captain Akinola Sennon, and under the musical direction of Carlton “Zanda” Alexander. Introduced to calypso by a Barbadian doctor in Britain, Masekela said he had been intrigued by the music, especially having being exposed to the works of Sparrow and the late Kitchener. 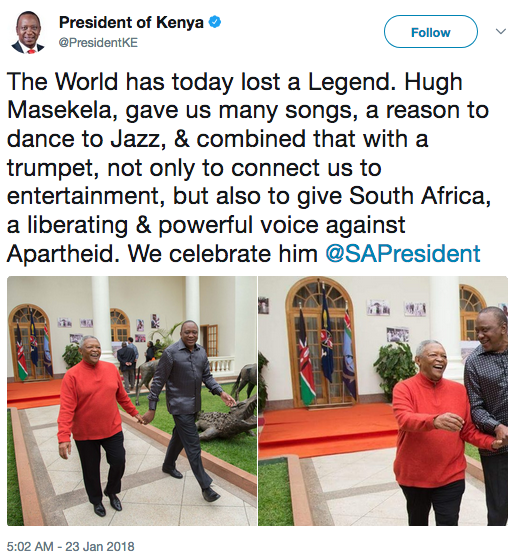 Following addresses by Douglas and Modiselle, and being presented with a Leroy Clarke painting by the Arts & Multiculturalism minister, Masekela gave a succinct response, one punctuated by many anecdotes about his well informed knowledge of our music, life style, cuisine and sense of humour. One time, Masekela evoked much laughter when he said the only delight he had not experienced in T&T was “saltfish,” no doubt referring to Sparrow’s double entendre ditty of the same name. But, he spoke at length about the hospitality of Trinbagonians and the effusive reception he got while being in the country, on his third visit. “Your hospitality here is unparalleled,” said Masekela, adding that the music of T&T was “sweeter” than the mangoes he ate. He also humorously quipped about being attacked by sandflies during his stay in Siparia, adding that the insects seemed to know that there was “new meat,” from South Africa, in the district. 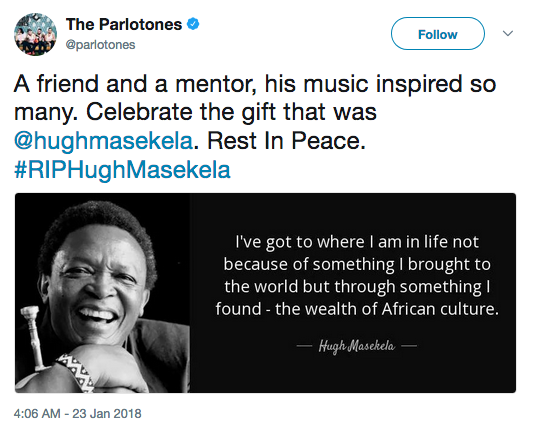 An associate of Phillip from their days of residing in Harlem, USA, Masekela first heard Deltones when the band performed on San Fernando Hill ten years ago. 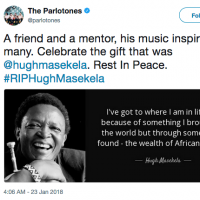 Impressed by what he heard, the Grammy Award nominated trumpeter approached Alexander to produce music which encompassed musicians from Cuba, Deltones and Masekela. Expressing surprise over the “musicality” of the members of Deltones explained how he encountered Alexander and the bond subsequently formed between them. He said that being in the studio for some time with the Siparia musicians made him feel as though he’d returned to doing exams. He added: “I felt like a pig in dirty mud. The (Deltones) musicians knew so much and were correcting me.” Masekela said the CD would be mixed in South Africa, mastered in California, USA, with a final product available by September 2013. 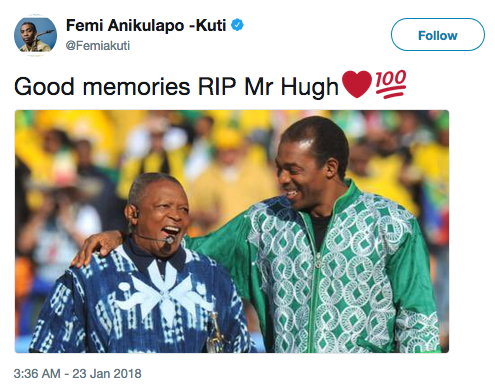 Definitely a Pan Africanist, Masekela said Africa has no borders, despite concerted efforts made by colonialists for the past 200 years to keep Africans on the continent and in the Diaspora separated. He said that calypso music reminded him of Ghana Hi Life music and the rhythms of some South African townships. At the end of Sunday’s reception, following a performance by Deltones, Masekela and a few guests were entertained at Legacy House, Clarke’s palatial residence in the hills of Cascade. 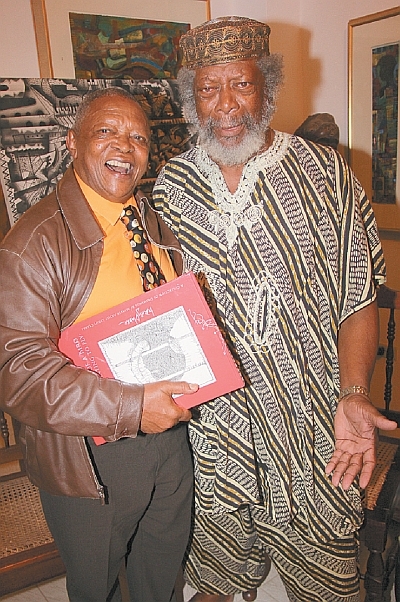 Gifts of Clarke’s books were presented to Masekela, Douglas and Commissiong Chow. 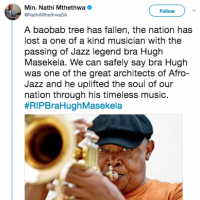 Masekela left South Africa in 1960 after the infamous Sharpeville Massacre, which left 69 people dead, when Trevor Huddleston, violinist Yehudi Menuhin and British jazz saxophonist and clarinetist Johnny Dankworth helped arrange his admission to London’s Guildhall School of Music. Masekela soon went on to attend the Manhattan School of Music in New York, where he met many jazz luminaries. 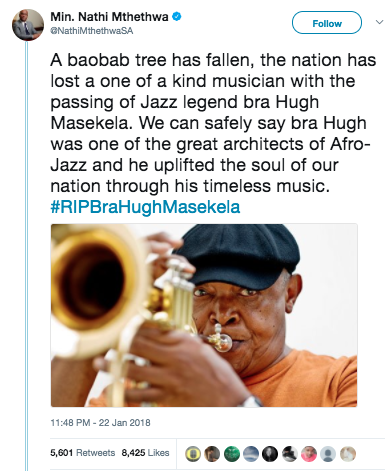 In late 1990, Masekela returned to South Africa to visit his mother’s grave for the first time. He now permanently resides in South Africa. 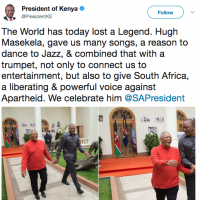 The recipient of numerous awards, 74-year-old Masekela has performed extensively globally, and his native Africa, performing with many of the international luminaries in jazz.